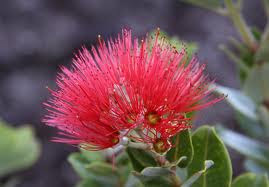 See here the Hawaii News Now up-date. Hawaii island tour operators enjoyed their own version of Black Friday weekend when lava from Kilauea Volcano’s Puu Oo vent spilled into the ocean Saturday afternoon, prompting a surge of business from locals and visitors eager to witness the spectacle. Geologists from the University of Hawaii-Hilo were on hand when the lava met the ocean around 1 p.m. at a location just east of the eastern foundry of the Hawaii Volcanoes National Park. 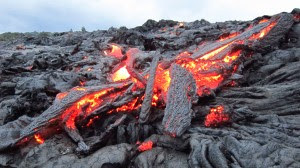 The lava entering the ocean comes from one of two active flows on the coastal plain. 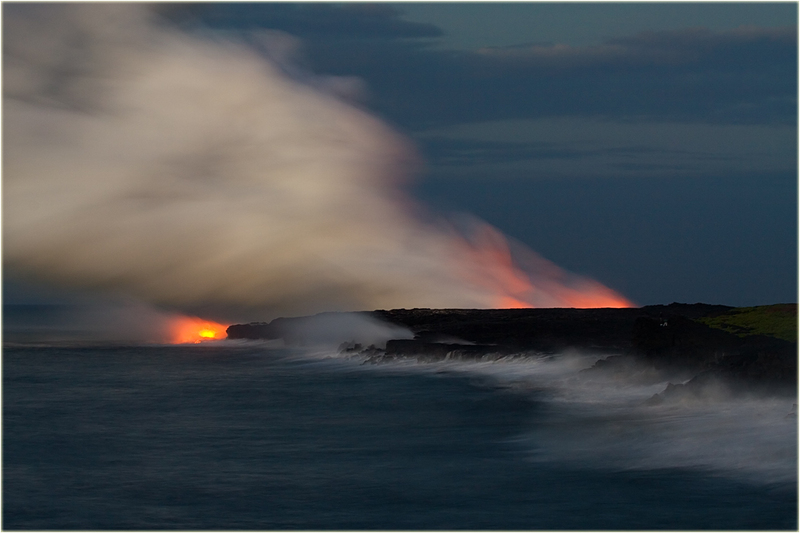 The volume of lava pouring into the ocean has not yet produced the dramatic steam clouds seen in previous ocean entries. Regardless, tour operators in the area had all the business they could handle today. “It’s always steady around here,” said Shane Turpin, lead captain at Lava Ocean Adventures and Lava Ocean Tours Inc. “It’s just more people are interested in seeing the active flow where it’s entering the ocean. Turpin spent part of a hectic Sunday morning on a video shoot for the Weather Channel. 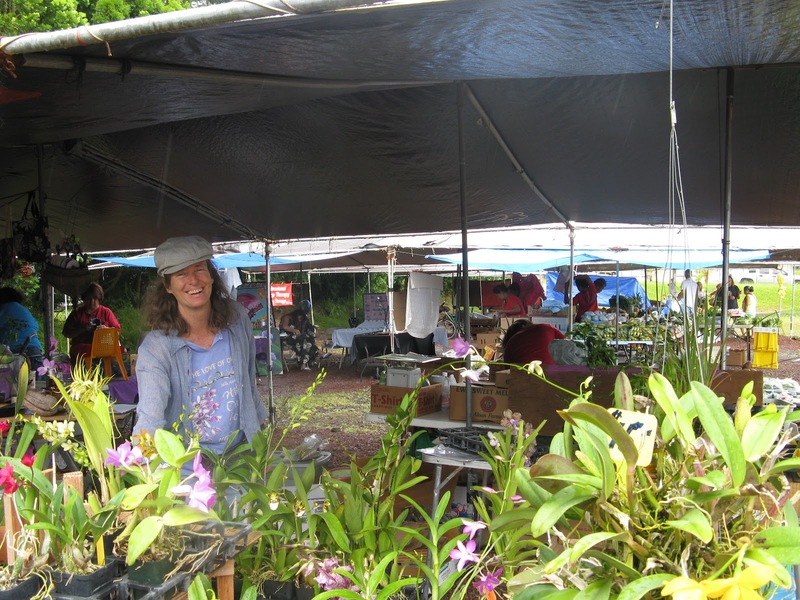 An experienced tour operator, Turpin has learned to react quickly to opportunity. 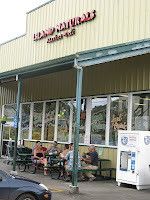 Blue Hawaiian Helicopters manager Chelsea Nichols said business at the Hilo location increased over the weekend with people interested in viewing the relatively rare event. The eruption in Kilauea’s middle east rift zone started on Jan. 3, 1983, and has continued with few interruptions at Puu Oo Cone or from vents within a few kilometers to the east and west, according to the U.S. Geological Survey’s Hawaiian Volcano Observatory. On Sept. 21, 2011, a fissure eruption on the east flank of Puu Oo drained lava lakes and fed a flow that passed through the abandoned Royal Gardens subdivision and into the ocean. The lava entered the ocean in December, but the flow stopped in January and hadn't reached the ocean again until this weekend. 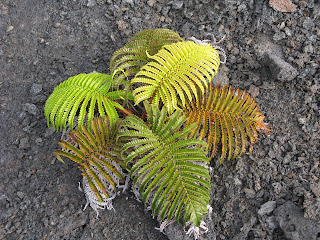 The Kalapana Lava Viewing Area is only 10 minutes from our Bed & Breakfast at the end of Hwy. 130. From here you can see lava flowing down the mountain towards the ocean from a distance. This area is easily accessible. 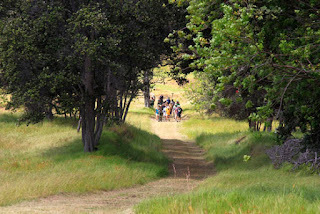 Lava Hiking Tours: Guided tours out to the lava are available almost daily through Kalapana Cultural Tours from Kalapana (10 minutes from us). The hike will take you directly to the lava flow. Guest feedback for these walks is excellent. You have to be in physically good condition to do the hike. Flashlights and water will be provided. 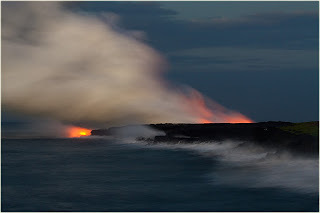 Lava Boat Tours by Lava Ocean Adventures leave from the Pohoiki boat ramp, which is a 10 minute drive from our B&B. 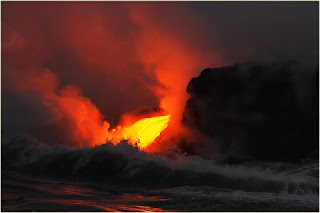 When the lava flows into the ocean it is an unbelievable experience to see how the elements meet. Captain Shane and his crew are an experienced team and offer visitors an unforgettable trip. Helicopter Tours from the Hilo Airport offer an aerial view of the Pu'u O'o crater, eruption areas, lava flows and ocean entry, when lava flows into the water. Flights are only available during the day, no night flights for safety reasons. Helicopter Tour operators include: Blue Hawaiian, Paradise & Safari Helicopters. 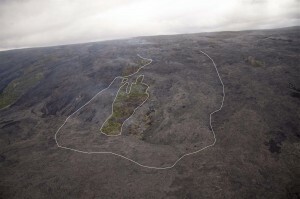 KALAPANA, Hawaii: Lava has once again reached the base of the Pulama Pali near Kalapana. The Hawaiian Volcano Observatory says advancing surface flows have reached the base of the pali over the past few days, burning through one of the few remaining forested kipuka in the abandoned Royal Gardens subdivision. 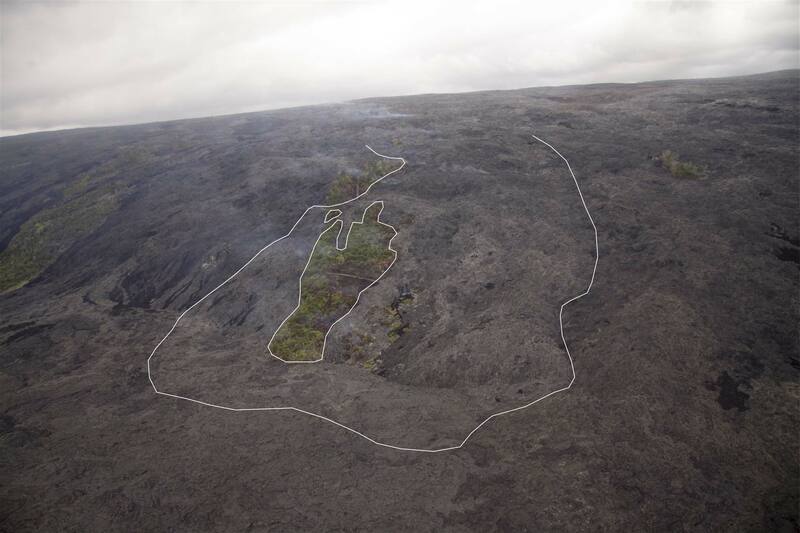 More lava lobes reached the base of the pali yesterday within the abandoned Royal Gardens subdivision and pooled on the coastal plain without advancing significant seaward. Yesterday, HVO and UHH geologists found that the flows had not advanced more than 150 m (490 ft) from the base of the pali. The pali flows have been easily visible from the County Viewing Area located to the east in Kalapana and mobile cam 3 while the flows on the coastal plain are in view of mobile cams 2 and 4. 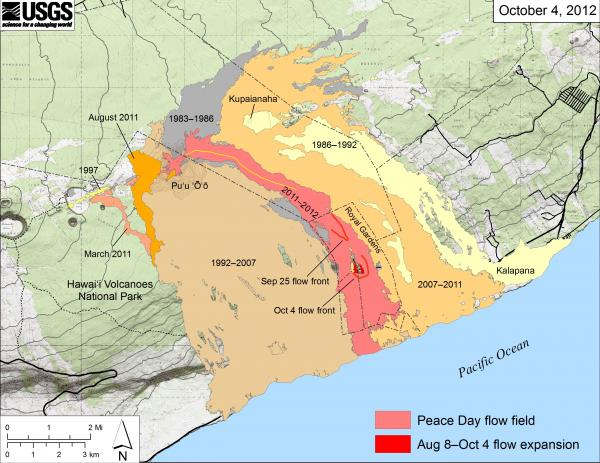 USGS photo showing the outline of the flow down the pali HVO released this photo (right), where a white line marks the outline of the active flows. 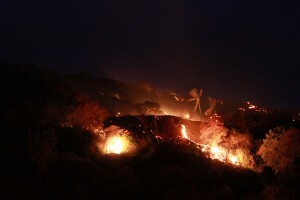 Another photo shows a closer view of lava flows cascading down onto the coastal plain at the base of the pali. 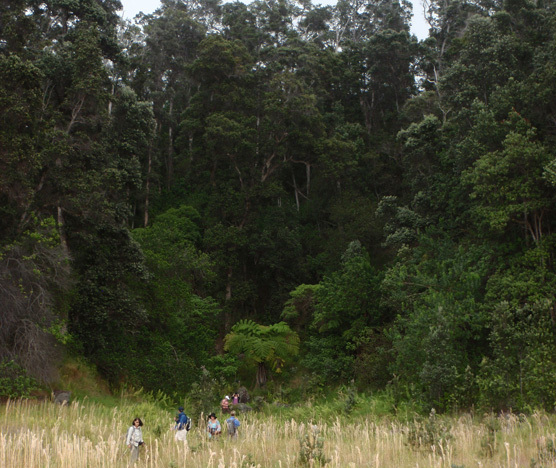 A remnant section of Orchid Street is visible just above the center of the image. Meanwhile, intrepid lava lover Bo Lozoff, who often guides lava field hikes when things heat up on the coastal plain, captured this video of the kipuku burning in Royal Gardens. 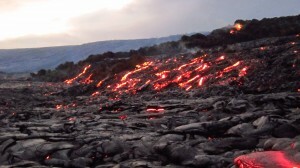 He also captured these images the immense lava flow. You can follow Lozoff’s volcano updates on his YouTube channel, “lavaloverbo” where he uploads video like this following his hiking adventures. 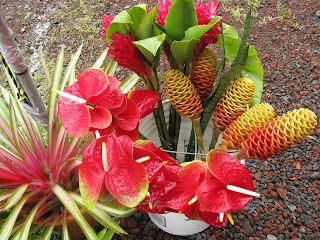 Stay at Hale Moana Bed & Breakfast and visit the Hilo, Pearl of the Pacific - only 30 minutes away. 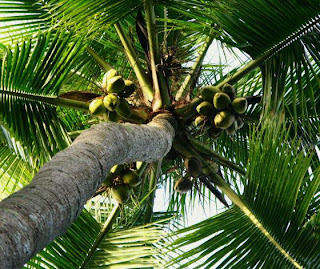 The 1st Annual Hilo Coconut Festival will take place on Coconut Island, a small island park in Hilo Bay, located right next to the hotels along Banyan Drive, on Saturday, October 20, 2012, from 10 am – 5 pm. This Festival is free to the public, and a perfect location for families and friends interested in a fun day of demonstrations on drum-making, weaving,rope-making and more. Traditional Hawaiian culture will be on exhibit with Hula dancing, ukele playing, and local entertainment. 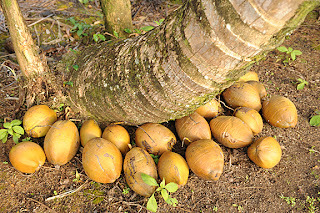 The highlight of the Festival will be a celebration of Hawaiian coconuts, and their multitude of uses from soap, cosmetics, coconut meat, coconut oil, and the processing of coconuts into refreshing drinks. The cultural and religious significance of the coconut will also be addressed. Coconut items will be on sale as well as treats and local dishes. Demonstrations of the uses and development of Hawaiian sugarcane, teas, and the Hala plant will also be explored. Amongst all of these symbols of Hawaiian culture will be children’s activities, such as face-painting, coconut bowling, coconut toss, and more. If you are interested in being a vendor or a sponsor, please contact Vince McMillon at cmcmillon@hawaii.rr.com. Check back for updates, and vendor applications. 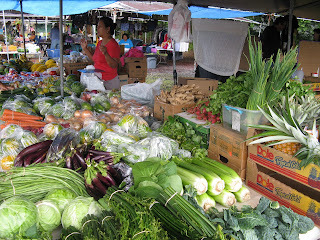 For more information see the Hawaii Tribune Herald. 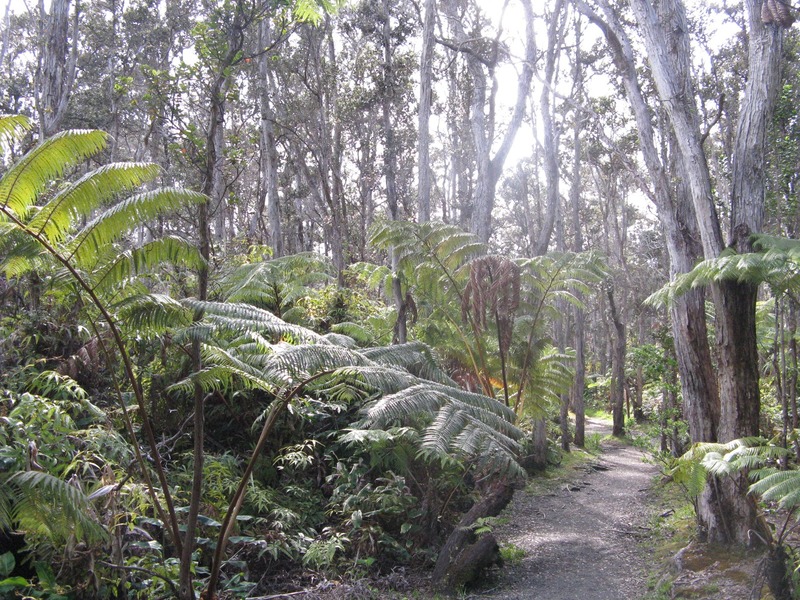 Stay at Hale Moana Bed & Breakfast and visit the Hawaii Volcanoes National Park and the Volcano Art Center - only 30 minutes away. 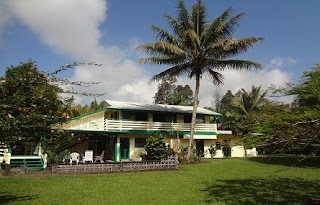 Pahoa is the closest town and only 5 minutes from Hale Moana Bed & Breakfast. Besides an alternative flair, it offers several excellent restaurants, grocery stores, a natural food store, health clinics, doctors' offices, pharmacies, three banks, interesting arts & crafts shops, and an open market on weekend mornings. 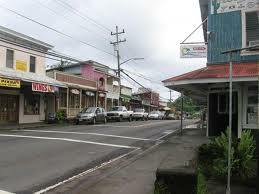 Pahoa is a historic town, built between 1909 and 1919. It began as a mill town, shaping railway ties for the great western railways. In sugar cane days, Pahoa became the crossroads for the railway. 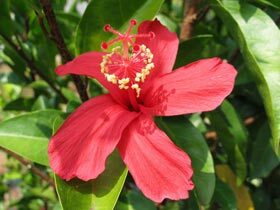 Today's industry consists of the diversified agriculture and tropical flower business. nineteenth century. 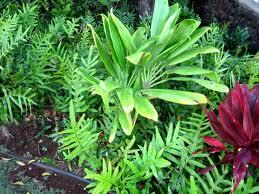 Unfortunately there are hardly any recorded historical accounts of Pahoa’s early years. The history of Pahoa should have been recorded by some of the immigrants or the earlier Niseis during the 1950s when most of the immigrants and the older Niseis were still living. During those years they were healthy with keen memories, able to recall and document information relating to the various events and activities that transpired during the late l800s and the ﬁrst half of the twentieth century. The need to record Pahoa’s history was constantly stressed to me from the mid-1980s by Shiryo Miyatake, an Issei, who arrived in Hawaii in 1918 from Hiroshima-ken, Japan. Stanley Oishi, one of the younger Niseis, and Robert Sugihara, a Sansei, also stressed the urgency of documenting the history of Pahoa very soon; otherwise all of the information relating to the early immigrants would be lost and gone forever. It must have been fate that I was born as the eldest son of a large family, whose parents were poor and constantly in ﬁnancial debt. Unable to continue my formal schooling after completing the ninth grade at Pahoa School, I remained in Pahoa throughout the many years to the present day. It was my destiny that I remained in Pahoa to research and write the many happenings of the lumber and sugar industries in which the immigrants worked and to document their contributions to the community. 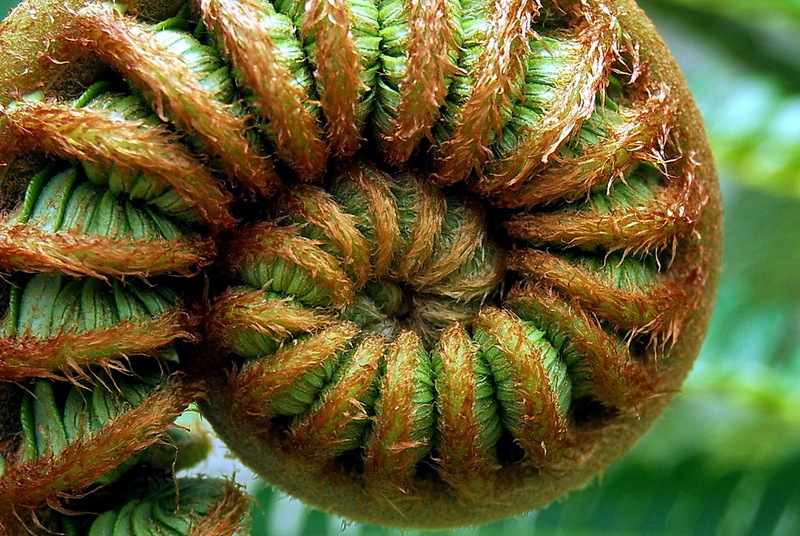 What actually prompted me to write Pahoa’s history? 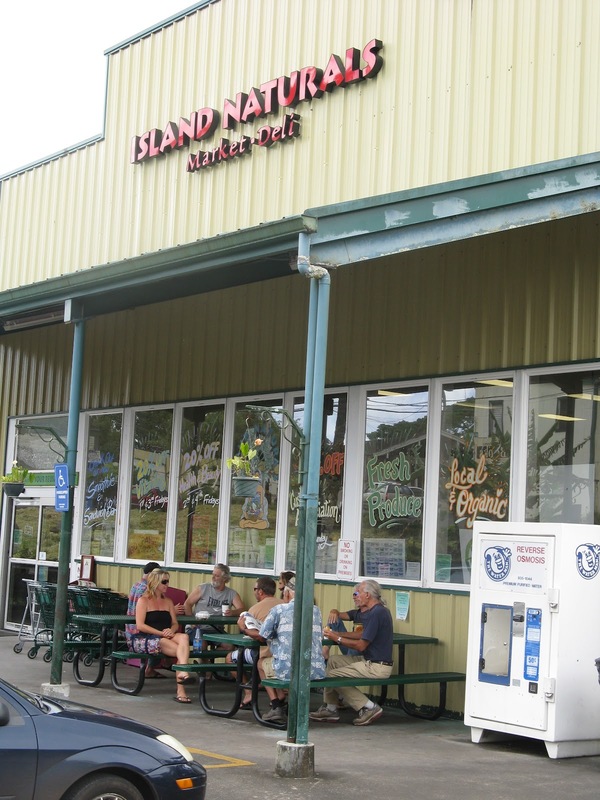 From the mid-1980s I realized the importance of preserving Pahoa’s history. 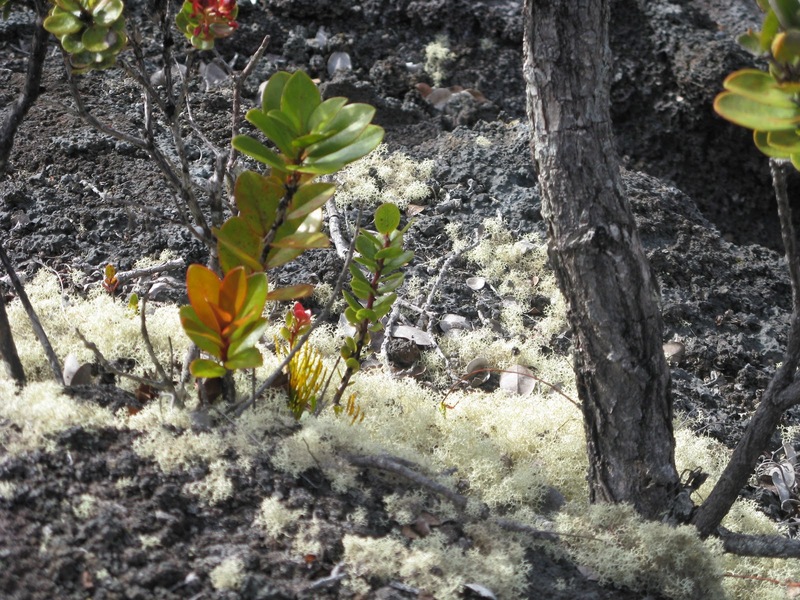 Noticing that hardly anything was recorded previously, I was concerned for the loss of the history, so I began collecting information about the early days of Pahoa." 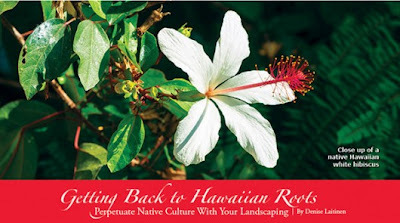 The arrival of foreign immigrants had the greatest impact on the Hawaiian race, as Hawaii’s population became cosmopolitan. 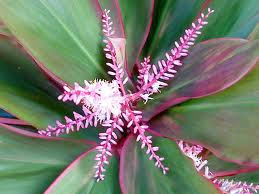 Many of the immigrants were bachelors and later married Hawaiian women. These interracial marriages resulted in greatly reducing the number of pure Hawaiians, and presently, the pure Hawaiian race is at the brink of extinction. 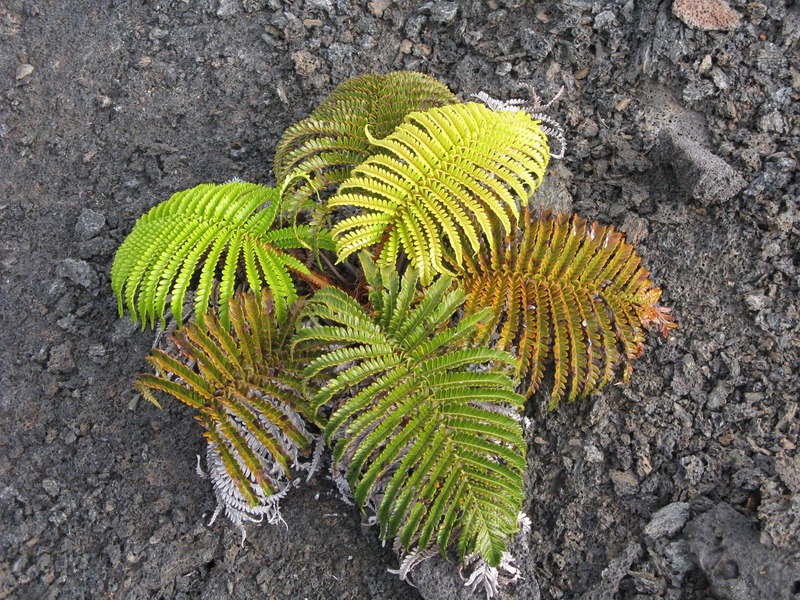 The first successful planting and production of sugar was at Koloa, Kauai by Ladd and Company. 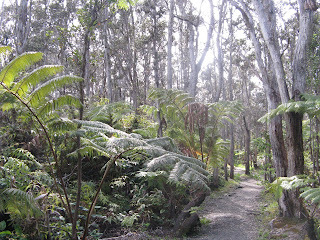 Earlier crude mills had been operated by the early Chinese immigrants on the island of Lanai. 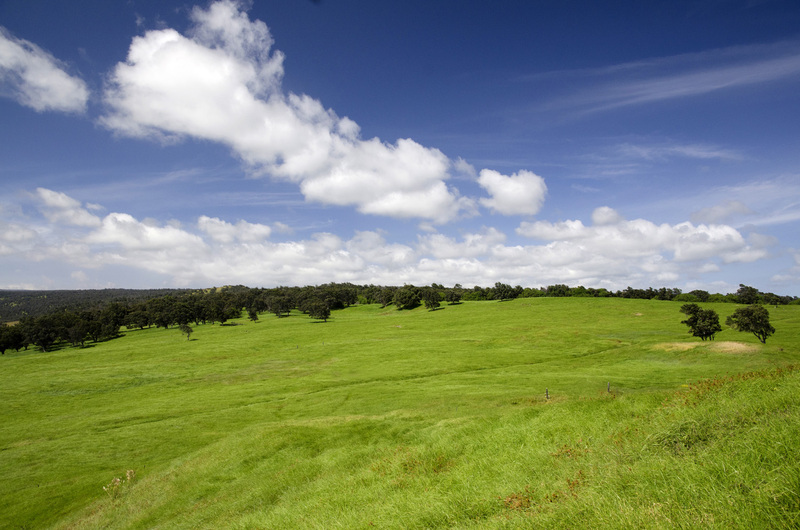 By 1880 there were seventy-two sugar plantations in Hawaii, One of the last plantations to be established was Olaa Sugar Company which harvested its first sugar crop in 1902. The lumber mill was situated about one hundred twenty-five feet east of the present Akebono Theater. It was commonly called “Pahoa tie millu” by the Japanese immigrants. 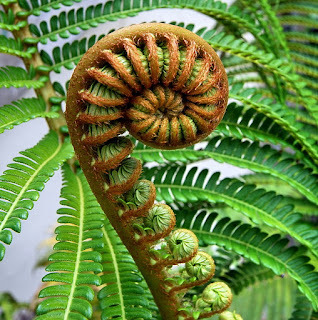 The Japanese a vowel to words ending with a consonant (except N), therefore mill was pronounced “millu.” The lumber company was originally started as the Hawaiian Mahogany Lumber Company, also referred to as Pahoa Lumber Company and later, the Hawaii Hardwood Company, James B. Castle of Honolulu was behind this company and Lorrin Thurston seems to have been financially during the early years. The railroad ties processed at the Pahoa Lumber Mill (1907-1918) were transported on rail flat cars to Hilo wharf and then transshipped on steamships to the mainland USA. Olaa Sugar Company transported a daily average of one hundred cars loaded with four tons of sugar cane each from Pahoa to Olaa Mill until 1948 when trucks began hauling directly from the fields to the mill. 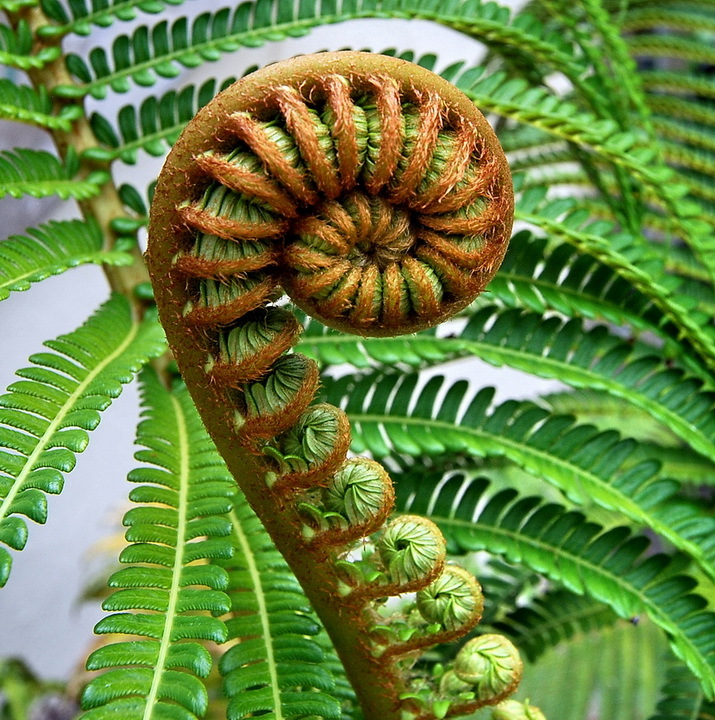 Kaleo’s (Pacific Rim Cuisine): Tell them about your reservation with us and receive 10% off your bill! Ning’s (Thai Cuisine): Tell them about your reservation with us and receive 10% off your bill! Ning’s is a BYOB. Paolo’s Bistro (Italian Cuisine): Tell them about your reservation with us and receive 10% off your bill! Paolo’s is a BYOB. There are many other eateries and take-out places, including Subway, L&L, No.1 Chinese BBQ, Boogie Woogie Pizza, Sushi, Burger King, KFC, etc.